MR Cardiac Package allows for volumetric analysis of ejection fraction, flow dynamics, and temporal enhancement of the myocardium. Our advanced visualization solution can support Radiologist & Cardiologist workflows. Other key features include semi-automatic LV/RV inner and outer contour detection, stroke/volume index calculation, AHA 17 segmentation and cardiac cycle color motion map display. For dynamic flow studies, multiple region of interest selection & background noise correction are also supported. TeraRecon iNtuition Solution Clinical Packages include iNtuition & AquariusAPS. Allows for volumetric analysis of ejection fraction, flow dynamics, and temporal enhancement of the myocardium. 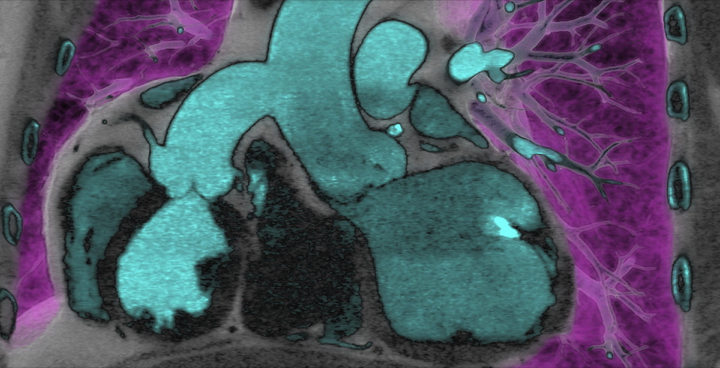 Our advanced visualization solution can support Radiologist and Cardiologist workflows. Other key features include semi-automatic LV/RV inner and outer contour detection, stroke/volume index calculation, AHA 17 segmentation and cardiac cycle color motion map display. For dynamic flow studies, multiple region of interest selection and background noise correction are also supported. TeraRecon iNtuition Solution Clinical Packages include iNtuition and AquariusAPS. Not 510k cleared, not for sale in USA. *T1, T2, and T2* mapping features are for research purposes only, not intended for clinical or diagnostic purposes.